A new track from Promoe, called “Den Ljusnande FRAmtid, is out! It deals with a new law here in Sweden, TSD is not meant to be a political blog so I will not go in to details about this law. But basically this law gives the Swedish government the right to check all Internet/phone-traffic that crosses Sweden’s borders, e-mail, SMS, phone calls etc. A real Big Brother society! Not only does this law violate our constitutional law but it was passed right before the summer vacations but it was passed against the Police and Swedish secret service advise and without any support from the people. As I said I will not go into detail about this law or my personal views of it but this track is a welcomed contribution to the debate. 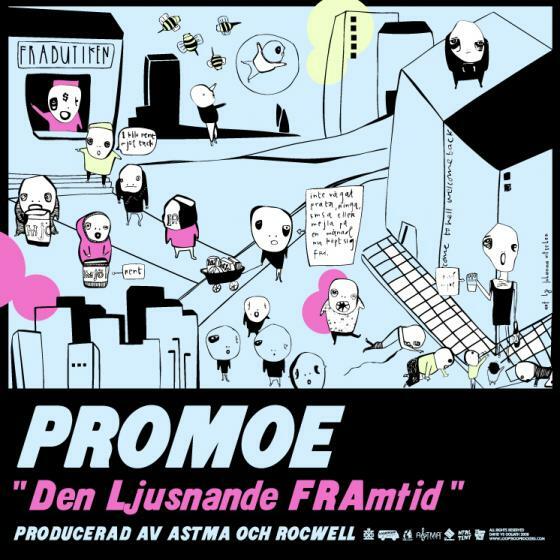 The track is also a sneak-peak from Promoe’s upcoming album in Swedish! The track is produced by Astma & Rocwell, the illustration is drawn by Johanna Ritscher and the layout was done by Time Will Tell. You can download the track here! This entry was posted in Nyheter and tagged Astma, DVSG, FRA, Johanna Ritscher, Promoe, Rocwell, Time Will Tell on August 13, 2008 by Daniel.